We've got to work together to have any chance of protecting our seas. Of course Southern Water has a massive part to play and we've invested millions of pounds to reduce our impact on bathing water quality. But we've all got to make the right decisions. I'm talking about what we put down the loo, the misconnections that flush dirty water into the surface water system, and the dog poo that doesn't get picked up. All these things and more affect water quality. But we have a plan. I’m really keen on making the plan work as the sea and I have history. I grew up in Brighton, which mean two things: I feel uncomfortable without water as a border to my horizon, and I bear the scars of years of abuse at the hands of my beloved Brighton & Hove Albion football club. I'm not sure if Brighton’s manager Chris Hughton is looking for a sluggish ex-smoker with a dodgy back to support the new premier league campaign but at least, as the new Bathing Water Manager for Southern Water, I'm playing a key role in protecting one thing that's defined much of my life. And I count myself very lucky to be in this position now. I get to spend a lot of my time meeting people across our 700 miles of coastline that rely upon bathing waters for community, for business and for leisure. I'm working with 21 councils, business groups, landowners and the Environment Agency to make sure there is no stone left unturned. 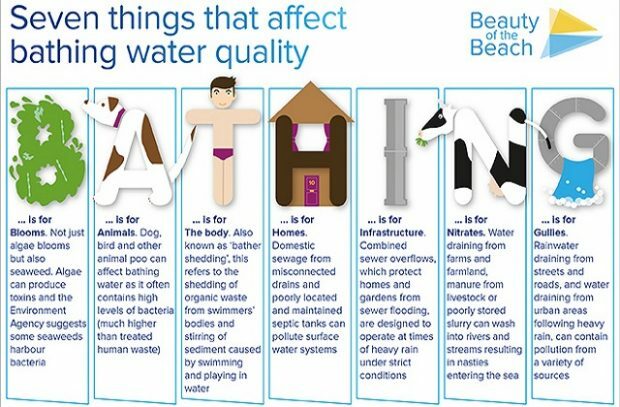 To mark the start of bathing water season on May 15 we announced the 'Magnificent Seven’: Deal Castle, Leysdown, Minster, Selsey, Middleton-on-Sea, Worthing and Shanklin. I can't wait to support my colleagues and work with local authorities, the Environment Agency and other organisations to find and fix the causes of pollution preventing these bathing waters from being consistently rated Excellent. This project and our joint Beauty of the Beach campaign with the Environment Agency are our means of galvanising the bathing water community to help us make improvements that will benefit everyone who lives near or visits our coast. We've had a really busy and challenging start to the Bathing Water Season. I've realised just how much effort goes into making sure our equipment and processes are working properly. What it takes to manage our network is staggering and I hope that I can help make sure that people outside Southern Water know how committed my colleagues are. The reliability of our assets - our pumping stations, sewers, treatment works and so on - is central to how we impact the quality of bathing water. When we've realised there might be a problem to deal with we have worked tirelessly to sort it out - but ideally we don't want to have to sort it out in the first place. Prevention is better than the cure, which is why we have to make sure our equipment is working as it should, we are maintaining our assets properly and correctly and are dealing with anything that's not right before it's too late. These are changing times for the water industry and the scrutiny on our services will only intensify over the coming months and years. So we need to be alert. Because our customers and regulators will rightly take us to task if we're not. Sometimes we can't control what happens. None of us can mitigate for a catastrophic power failure during a heavy downpour of our finest summer rain. But we can still do all that we can to manage that situation. That's why I've been travelling throughout our region to meet beach lifeguards in Brighton, wildlife and marine conservation groups in Kent and councils from the Isle of Wight to the Isle of Sheppey. What I've learnt is that everyone wants the same thing – to do whatever it takes to protect and support this incredible resource for our communities, our businesses and our wildlife. What does a successful bathing water season look like? This season, like every other, we'll be watching closely for the final EA bathing water results for the year to come in. We'll know too that, considering our own efforts, the results must be measured against other factors as well. Bathing Water season runs from May to September, and the Environment Agency take water samples from bathing waters, around once a week. The samples are tested for certain types of bacteria which indicate the presence of pollution, including from sewage or animal waste. An increase in bacteria indicates a decrease in water quality. It's that simple. We can only do what we can do, but we can make sure we do it well. That, for me, will be a success. For more information on bathing water quality check out the Environment Agency’s Bathing Water Data Explorer, or Southern Water’s Beauty Of The Beach.